There’s certainly plenty of Italian restaurants around the city but to find one that really impress is not many. 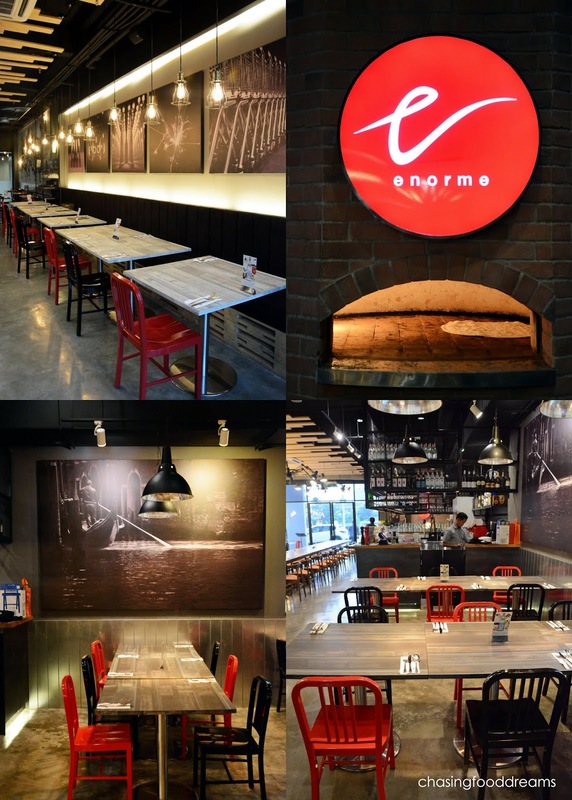 So when I came across Enorme, a modern Italian restaurant serving Italian cuisine and wood fire pizza located in the new PJ Centerstage mall, I was pretty stoke. And this one serves pork… need I say more? Enorme looked deceptively plain from the outside but as soon as one enters, the ambience is really modern and contemporary. It is also stylish as the interior is themed with lots of black, red, white and earth tones. The warm lighting gave the ambience a stylish comforting mood. Dark and light artistic posters together with a large mural of artistic rendition of a musical band added lots of charm to the restaurant. 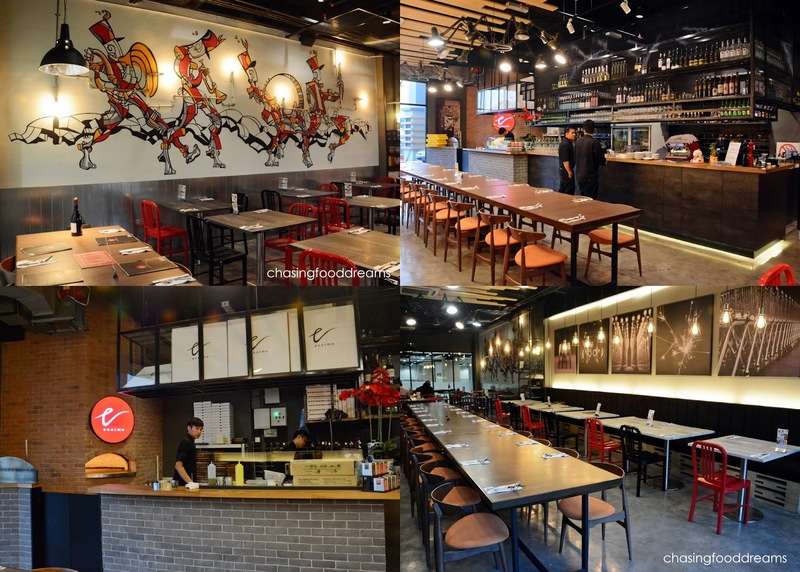 There is also a long bar that adjoins to a pizza bar where diners can catch glimpses of some pizza actions going on before it is baked in the wood fired oven. As soon as we settled down, we logged in our orders of mocktails and smoothies of Virgin Pinacolada (RM16), Mango Lassi (RM15), Watermelon Cooler (RM15) and Avocado Smoothie (RM15). My Virgin Pinacolada is delicious and creamy. Dinner kicked off with Insalata Aragosta (RM22), a signature of Enorme, is diced lobster meat dressed in a creamy mayo based sauce with apple and celery on a bed of green salad. I can taste the sweet small chunks of lobster meat in the salad and it goes really well with the tangy creamy dressing. Its quite a simple dish but I enjoyed the flavours of the dish. Portobello (RM23) turned out to be another hit! Golden and crispy fried portobello mushroom has a crowning glory of chicken and onions in au jus. The Portobello mushroom is so juicy and meaty inside. The chicken and jus is wonderfully flavourful with a good balance of savory and earthy flavours. It’s just a winning combination from every aspect of the dish. We also had their Zuppa di Mare (RM38), a robust seafood soup filled with tiger prawns, fish, squid, clams and crab meat. There is also cherry tomatoes and grilled baguette with the soup. The soup is bursting with loads of seafood essence, unctuously rich and tasty. Every sip of the soup is a filled with pure oceanic sensations. Each seafood is cooked beautifully too. The cherry tomatoes added fresh juicy notes while the crispy baguette is perfect to soak up that glorious soup. Carbonara Pizza (RM14/RM33/RM63) was the piece de resistance of that evening for me. Just look at that pizza and tell me it’s not beckoning to you! Enorme wood fire pizza rocks like big time. This version is actually a bianco pizza which means it is a white pizza with white sauce. Inspired by the luscious carbonara flavours and ingredients, this pizza has lots of streaky bacon pieces, mushrooms, egg yolk, cream sauce and mozzarella cheese. The thin pizza base was crusty on the edges and lightly chewy on the inside. The salty and creamy notes of the bacon, cheese and cream is utterly sinful and so scrumptious. A nice sprinkling of herbs gave this pizza more aroma. The egg yolk added more lusciousness to this already sinful pizza. Simply gorgeous! Anatra (RM32) attracted our attention as it had pulled duck confit in it. Tossed with the pasta was also sun dried tomatoes, garlic slices, parsley and parmesan sauce. We enjoyed this too as it is not overly heavy and yet there is a nice richness from the duck confit which is balanced out with the tangy sun dried tomatoes and soft garlicky notes. I wouldn’t mind ordering this again. From the main course section, we had Carre di Maiale (RM51), 250gm of US pork rack beautifully chargrilled to perfection. It may looked a little pale but rest assured, flavours are there. Cutting into the pork rack, I can see how moist it is. It is also very tender and tasty. Served simply with jus, a side of orzo pasta with green peas and baked tomato. Porcine lovers will be pleased with this dish. Piatti di Agnello (RM55) has three generous cuts of lamb rack crusted with pistachio crust and baked till medium. It is served with a tomato caponata and sautéed lentils. The lamb is also pretty good. It is succulent and tender and has good solid meaty flavours. It goes really well with the tomato caponata. Although I am not a lentil person, I didn’t mind this as it added a nice textural touch to the lamb. Dinner ended with Deconstructed Tiramisu (RM19) and Passion Fruit Granita (RM16). The Deconstructed Tiramisu is a signature dessert. Taking the classic Tiramisu and give it a modern deconstructed twist, one get soft creamy whipped mascarpone cheese served with sponge finger crumbs, coffee jelly and coffee sauce. The coffee elements is pretty strong and gave this dessert a big hit of coffee notes. Though it’s pretty straightforward, the Passion Fruit Granita is beautifully refreshing and fruity. The topping of fresh berries and citrus slices topped with mint lime coulis, this dessert made a light and vibrant ending to the meal. It’s a great Italian restaurant! Enorme sure got lots of potential to be a big hit as the food here is made with lots of thoughts and loves. Resident Chef William Teh certainly did a delicious job in constructing the menu for Enorme. Must-haves at Enorme are the Carbonara Pizza, Carre di Maiale, Anatra and Zuppa di Mare. What a great find…. Oh, my kind of pizza! So many bacons and the egg yolk is very enticing! Btw, where is PJ Centrestage? =.="